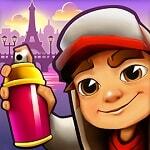 The game Skate Hooligans performed in the style of all known Subway Surfers. The protagonist tries to escape from the policeman, jumping on trains and overcoming obstacles on his way. Collect daily bonuses and coins on the road to get improvements.